Buy Bare Root Portugal Quince trees for sale online FREE DELIVERY from UK suppliers of garden fruit trees. An early ripening variety of Quince so you can expect to be cooking with them from late September which is to say if you experience "normal" weather patterns you can have them then. If you last saw your Portugal Quince tree floating off in the pot down the street because of severe flooding, it is highly unlikely you will get a harvest of Quince fruits that year. That being said it does produce high quality Quince fruits that turn pink when cooked. Apparently good for making marmalade . 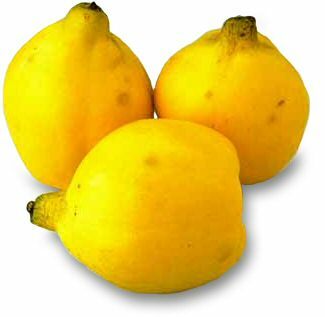 Fertility: This Quince variety is not self-fertile, so you will need another Quince to guarantee fruit unless you have another Quince tree within a few miles of you. A housing estate or reasonable sized community is likely to have this. Our Quince, Portugal is supplied at a height of between 1.0 and 2.0 metres as a Maiden on a Quince A rootstock. This means that we have not shaped it in anyway and all being well, the final height will be 3.5 metres.